Holli M Cohoon, the 911 operator who gave phony testimony against the victim we have been reporting about continues her attacks on the victim. 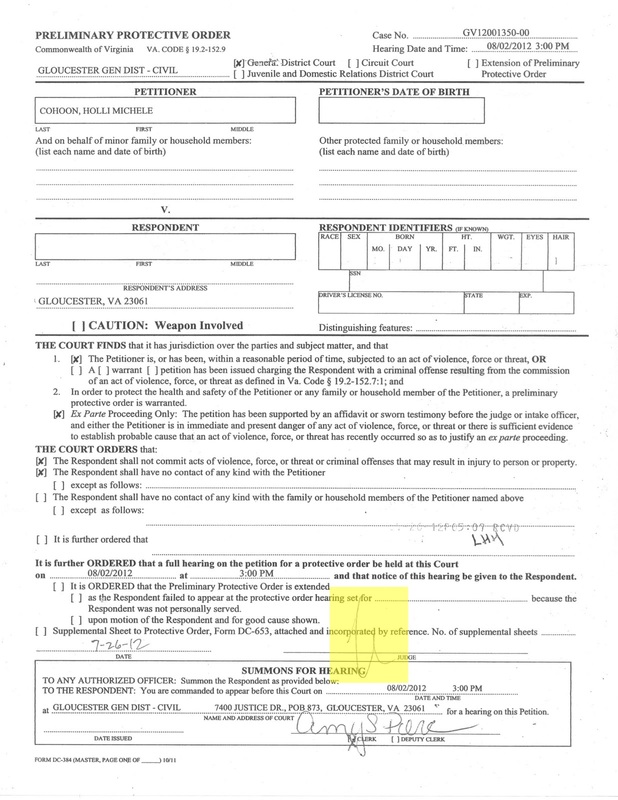 We have added this copy of yet another petition for a protective order coming from Holli. This one delivered after the other one expired. We removed the victim's name from the document. 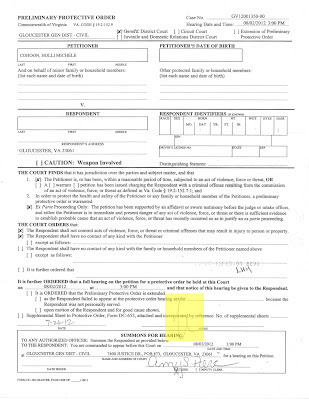 This particular order has a court date added to the bottom. August 2nd, 2012 at 3:00 PM at the Gloucester County Court House. Something that was missing from the Emergency Protective Order. Now anyone can get an emergency protective order against anyone else at any time. The procedure is quite simple. You just have to stand before a Magistrate and state a complaint and the order will be given. Get to this next level is much harder however and the nasty little trick that Gloucester County used to create this one was very underhanded and will be our next article. Also, from what we have been informed, the way in which this order was delivered was highly questionable. Here is what we have been told in the way in which this was handled. Numerous Gloucester County Sheriff's Deputies delivered this describing this only as a two week extension of the first order and that there could be a third extension. They were very sure to point out that this was only an extension. Not a summons to appear in court. Now why would the Sheriff's Deputies do this? Were they hoping that by misrepresenting the paper that the victim in this case would not bother to read it? Maybe then not bother to show up in court? That is what we are betting on. Now what could possibly be gained by doing such a nasty trick? We will cover that in another story.